We were already pretty busy early in the week with the midterm elections, but things escalated quickly into an all-hands-on-deck weekend. Let’s start in Southern California, where our LA-based News Group engineers were on the scene in Thousand Oaks soon after the Borderline bar shooting for CNN’s coverage of this horrific event. Bob Tweed and David Conwell were there first, and Bill O’Toole traveled in shortly thereafter to provide some relief. And then the fires broke out. Those three will be there covering all the breaking news, while in Northern California we have Todd Anderson and Steve Mills working the Paradise fires near Chico, CA. These veteran engineers are well-accustomed to working through challenging conditions, but we’re all hoping the wind dies down soon and the fires go out. Our LA-based Global Services engineers are also mighty busy. Mark Huss is coming off some election coverage of his own in Phoenix, which was followed by Golden Boy on ESPN boxing in Indio, CA on Thursday night. He’s currently the last unscheduled engineer on this weekend’s schedule, for now at least. Wes Hill is at Barker Hanger in Santa Monica to provide encoding services for E! Network’s broadcast of the People’s Choice Awards, live on Sunday night. 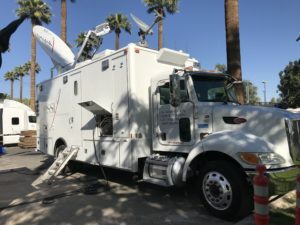 John Bright will be there, as well, to provide production and uplink services out of our K34 truck for Telemundo’s Red Carpet special. Alex Mestizo will assist on the B-unit, and senior engineer Tracy Michaels will fly in to work with all of our guys on show day Sunday. Still more LA-based engineers are out on the road. Chris Hovden is back on the C27 mobile teleport to work some NASCAR alongside Kyle Meyer. They are all set up at the Phoenix International Raceway for the Can-Am 500 NASCAR Weekend, which will culminate in the Monster Energy Cup Semifinal Playoff race on Sunday afternoon. This is the penultimate race of what has been an extremely successful and exciting 2018 NASCAR season. Lots of action coming up next weekend when we close out the season at Miami Raceway. Larry Sheets isn’t too far up the road from the track at the Phoenix Country Club. He’s there for Golf Channel’s coverage of the Charles Schwab Cup, which will finish up Sunday. Keeping out West – way out West – brothers Paul and Brian Blomstrom are in Waipahu, Hawaii for some more high school football action Friday night. It’s Iolani versus Waipahu, live from the big island. While they’re in town, Brian and Paul will prep our equipment and vehicles for what’s going to be a busy winter for basketball, football, golf, and more. Before we get to the football schedule, let’s go south of the border to Mexico, where we have a couple of major events going on this weekend. Kevin Spangler and Jose Sanchez are in beautiful Mayakoba, Mexico to provide extensive transmission services for Golf Channel’s coverage of the OHL Classic, live from El Camaleon. Working alongside our partners from Telecomm, Kevin and Jose have been rock solid all week. Roxana Sanchez, Jose’s better half, will join the guys for the final rounds this weekend to ensure everything goes off without a hitch. Up the road in Mexico City, Mike Lemieux and Robert Sanchez are at the Foro Corona for Inside Xbox: XO18, a weekend of gaming and demos for Microsoft’s Xbox platform. Mike and Robert are also working with Telecomm to provide a 1080p transmission for distribution back to the States. Now let’s talk about some football! Senior engineer Rick Ball is back in Tuscaloosa, AL for Saturday’s SEC Game of the Week on CBS. The Mississippi State Bulldogs are in town to take on the Crimson Tide in what will surely be an uphill battle against the number one team in the nation. It’s an SEC doubleheader on CBS this weekend. Before Rick’s game kicks off at 3:30 ET, John May will be finishing up his transmission of Ole Miss versus Texas A&M, live from Kyle Field in College Station, Texas. Not too far from John, Justin Roszak is setting up the CK48 in Houston, TX for yet another at-home transmission for our friends at CBS SportsNet. The Temple Owls are in town to take on the Houston Cougars on Saturday night. Justin will multiplex 14 video signals from production and uplink to satellite. PSSI International Teleport (PIT) takes down the signal and hands it off to CBS via the AT&T Global Video Services network. Having that direct fiber connection to CBS headquarters in NYC is one of a few critical links in this transmission chain, and our team has it all down to a science from start to finish. Steve Toth is handling an at-home transmission of his own, this one via fiber for ESPN. He’s setting up one of our at-home encoding and multiplexing kits at Bobby Dodd Stadium in Atlanta, GA, home of the Georgia Tech Yellowjackets. The Miami Hurricanes are in town for a game on Saturday, and Steve will be the primary path out of the stadium and back to ESPN headquarters in Connecticut for production. Plenty of big games on the Fox networks this weekend. 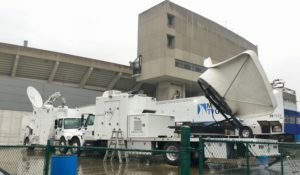 Our 4K game of the week is in Morgantown, WV, where 4K guru Rick Varney is alongside senior engineer Jim Flowers outside Mountaineer Field to set up our 4K/HD mux of Saturday’s game. 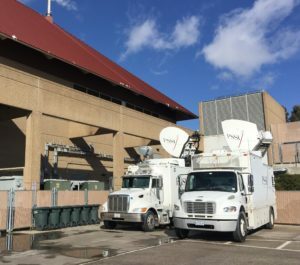 The TCU Horned Frogs are in town, and our two trucks and engineers there will make sure football fans get a perfect picture on their 4K televisions. Jim’s going to head to Maryland after the game for a little NCAA basketball on Monday, when he’ll provide a multiplexed transmission for ESPN’s broadcast of Maryland versus North Carolina A&T. We have another two-truck game at the University of Iowa’s Kinnick Stadium, where Steve Chaisson and Rick Kolinek will be setting up for Northwestern’s visit to the Hawkeyes. 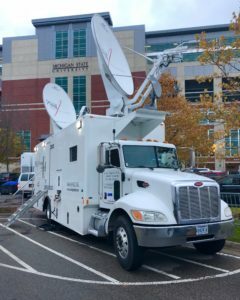 We have also have a C/Ku transmission at Spartan Stadium in East Lansing, MI, but this time there’s only one truck. Blake Blomstrom and Steve Hagerty are setting up the newly refurbished CK25 mobile teleport for Saturday’s game between the Michigan State Spartans and the Ohio State Buckeyes. We’re back in West Point for more Army football on CBS SportsNet. This week it’s Nick Ray on C42 at Michie Stadium, where the Army Black Knights will host the Lafayette Leopards on Saturday. Dave Mitchell’s back in Clarion, PA for the Pennsylvania Sportsfever Television Network Game of the Week. The Clarion Golden Eagles host the East Stroudsburg Warriors at Memorial Stadium. More Sportsfever in Baltimore, where Dennis Smith will be on hand for Saturday’s battle between the Morgan State Bears and the Delaware State Hornets. Two Big Sky Conference games this weekend. David Meyer’s in Moscow, ID at the University of Idaho’s Kippie Dome for Montana’s visit to the Vandals. Not too far across the snowy mountains we’ll have Ray Loyko back in Bozeman, MT for Montana St. versus Northern Colorado. Mike Howley’s at Gillette Stadium in Foxboro this weekend, but not for the Pats. BYU is in town to face UMASS on Saturday, and Mike’s handling some pre- and post-game live shots for our friends at LBiSAT. We’re already dabbling in some college hoops to kick off what will be a busy winter. Dave Buckman’s back in Annapolis, where the Naval Academy is hosting the annual Veterans Classic basketball tournament. It’s Providence versus Wichita State in the first game of a doubleheader, followed up by Navy versus Maryland in the prime time game. On Sunday, Mati Kerpen will be in Storrs, CT, where the Huskies will host the Ohio State Buckeyes at Gampel Pavilion. Jonathan Ayala is still plugging away down at IMG Academy in Bradenton, FL, where we continue our services at the 2018 CONCACAF U-20 Championship. He’s been doing daily transmissions for about 10 days, and loving every minute of it! Chris Golden comes down to lend a hand with a second truck this weekend as the tournament starts to heat up. And last, but never least, we’re fighting. We are back at the Casper Events Center for more Bare Knuckle Boxing on Friday night. Engineers Craig Henry and Todd Harvey are joining forces with project manager Victor Verno in chilly Casper, WY, for the second World Bare Knuckle Fighting Federation pay-per-view event in one of the few states to sanction the sport. Not too far down the road we’ve got another UFC event with our friends and partners at Concom. EIC Tracy Michaels and project manager Keith Valeri will work with engineers Joe Cox and Mike Sheehan at the Pepsi Center in Denver, CO for UFC Fight Night 139. It’s Chan Sung Jung, the “Korean Zombie,” versus Yair Rodriguez in the main event, but our team is already onsite for testing and a full afternoon of undercard fights on Saturday, all of which will be distributed to MMA fans around the world. Big thanks to our guys in the field, our teams in the shops and offices, and our customers! We’re keeping up the pace!